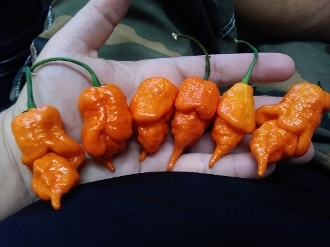 This listing is for ONE (1) pack of "Long Tailed" Trinidad Scorpion Orange Seeds! Each pack contains 20+ seeds. This variety will grow from seed to harvest in approx 160 days. The peppers will mature from Green to Orange in color. The Orange varieties are GREAT for making HOT sauce or dehydrating and turning them into powder for your own personal SPICY seasonings!! Order some and try your hand at growing them in your garden! !